Escape the stress, aches, and pains of the outside world as you slide into your own exotic spa. Roll back the cover and immerse yourself in an experience the Japanese have practiced for centuries – a good soak does wonders for both body and soul. How do you envision your own private sanctuary? Browse our gallery of photographs to get ideas from the variety of installations created by our customers. A complete starter package costs only $2,539. Review our complete list of factory-direct Internet pricing. Superb quality, industry-leading energy efficiency and a very long product lifespan (40+ years!) mean Great Northern® hot tubs deliver maximum value. CANADIAN HOT TUB CUSTOMERS, Click here for new lower prices!! "Combining Beauty, Functionality and Cost-Saving Technology Since 1975"
Hot Tubs, Rubadub Tubs®, and Roll-Up Covers® are manufactured with exceptional craftsmanship from the highest quality materials. 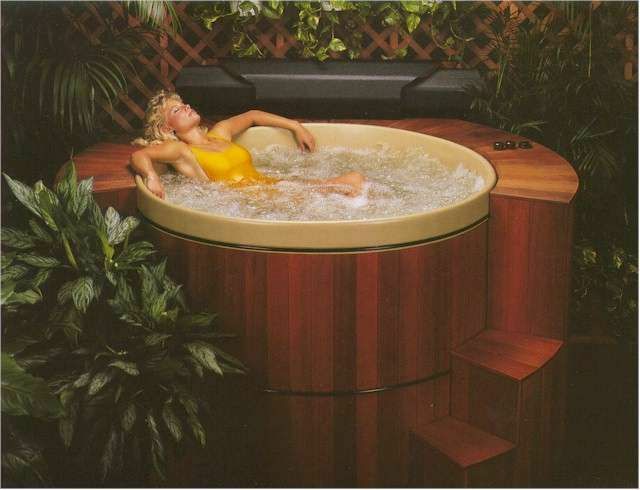 The Rubadub Tub® was the first lined and fully insulated Round Wooden Hot Tub created in the mid-seventies. 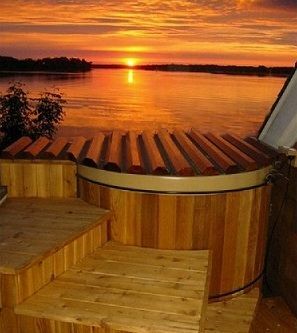 Today our Cedar Hot Tubs, Redwood Hot Tubs, and Rubadub Tubs® continue to retain the beauty, depth, and leg room of traditional Wooden Hot Tubs. Our tubs are all available in Cedar with a Redwood option available for some sizes. Designed with the customer in mind, our 54 sizes of custom made Portable Hot Tubs, Exercise Tubs, Swim Spas and Rubadub Tubs® offer flexibility in size, seating, and jet placement. Also, you can learn more about our strong and attractive Roll-Up Covers®, which are available for any of our tubs or we can custom make one for your existing hot tub or spa. TRUE COMFORT - True "Deep Soaking", 44" Standard Depth (deeper available). Legroom to stretch, no footwell. VARIETY OF SIZES - 3' to 12' diameter (1 - 18 person) and 3' to 6' deep, in stock. Custom sizes and depths are available. MAXIMUM FLEXIBILITY - Seating height is easily adjustable, with bench style seats. Custom jet placement is also available. ENERGY EFFICIENT - High R-Value Insulation. Low heat loss. Insulation won't water log. FREEDOM OF PLACEMENT - Designed for indoor or year-round outdoor use, even in the harshest winters. LIGHTWEIGHT - Most are under 200 Lbs! Compare that to spas weighing 700-900 lbs. PORTABLE - Fits through 26-inch doorways. EXCELLENT VALUE - Purchase Complete Deluxe Systems or Tubs only. Finest Full-Sized support equipment. Cedar skirt included. Redwood available. FLEXIBLE POLY-TEX™ SHELL - 10-year limited warranty. EASY TO SHIP - Our Hot Tubs are available as easily shippable do-it-yourself kits. EASY TO ASSEMBLE - Kits or pre-assembled to your specifications. TAX DEDUCTIBLE if medically prescribed. Why a GN Hot Tub?